Ferrocenyl-N-(pyridinylmethylene)anilines Schiff bases were synthesized by reaction of 3- or 4-ferrocenylaniline with either 2-, 3-, or 4-pyridinecarboxaldehyde under solvent-free conditions via mechanochemistry technique. Products were obtained in excellent yields within 10 min of grinding. The reactions afforded a melt or gummy semi-solid that solidified to the desired Schiff bases within a short time. These Schiff bases were reduced to their corresponding amines, ferrocenyl-N-(pyridinylmethyl)ani-lines, with NaBH4 over neutral Al2O3 solid support via grinding. Amines were obtained in excellent yields after intermittent grinding for approximately 1 h. Herein, five novel ferrocenyl-N-(pyridinylmethylene)anilines (compounds 3, 4, 6-8) and six ferrocenyl-N-(pyridinylmethyl)anilines (compounds 9-14) are reported. Compounds were characterized through FT-IR, 1H-NMR, 13C-NMR, HRMS and SC-XRD techniques. These compounds show visible solvatochromism, when UV-Vis absorption was measured in polar and nonpolar solvents. In changing solvent from polar to non-polar, the Schiff bases exhibited a blue shift while the amines portrayed a red shift. Electrochemical studies on these compounds reveal that redox behaviour of the iron centre is influenced by the position imine or amine groups. Antimicrobial properties of these compounds were studied for Escherichia coli, Staphylococcus aureus, Salmonella typhimirium and Candida albicans. Highest activity was recorded against Gram-positive bacteria and fungi. Ferrocene (dicyclopentadienyl iron) is a treasured compound discovered serendipitously1,2 and its structure was determined3-5 in the early 1950s. This discovery has impacted greatly on the rapid growth of inorganic and bio-organometallic chemistry.6,7 The unrelenting study on ferrocene and its utilization in many diverse applications are attributed to; (i) the stability of the ferrocene scaffold to moisture, air and temperature; (ii) the ease of functionalizing the cyclopentadienyl rings in ferrocene skeleton via electrophilic substitution to give monosubstituted, 1,1'-di-substituted or 1,2-disubstituted moieties rendering it a pertinent building block; (iii) sufficient rigidity of the sandwich structure providing an appropriate chiral environment; (iv) its readily accessible reversible redox couple; (v) stability of the ferrocenyl group in aqueous aerobic media and (vi) its high electron density and aromaticity.7,8 The ferrocenyl unit is also known to modify the shapes of molecules as well as the physical properties such as colour, polarizability and magnetism.9 Generally, studies on ferrocene revolve around generation of compounds that are used in materials science,10 electrochemistry11,12 catalysis,13-15 medicinal applications16-24 and nonlinear optics25,26 amongst others. Though majority of ferrocenyl Schiff base derivatives are synthesized in solution via reflux,58-60 in this study, the compounds were synthesized via mechanochemistry (Section 2.2), a relatively faster and greener technique. Reduction of ferrocenyl Schiff bases has previously been reported by use NaBH4 in methanol over a period of long periods;61,62 however, in this study reduction of the imines was achieved timeously with NaBH4 over a solid neutral Al2O3 support via mechanochemistry technique as reported in Section 2.3. Electrochemical, thermal and spectroscopic studies of the compounds are reported. The compounds were also investigated for antimicrobial activity against Gram-negative bacteria Escherichia coti and Salmonella lyphimirium; Gram-positive bacterium Staphylococcus aureus and the fungal species Candida albicans. All chemicals were of reagent grade quality purchased from commercial sources and used as received. These included: ferrocene 98 % (Aldrich, USA), sodium borohydride 99 % (Merck, Germany), 4-nitroaniline 98 % (Merck, Germany), 3-nitroaniline 98 % (Fluka, Switzerland), methanol 99.5 % (Aldrich, USA), sodium nitrite 98.5 % (Associated Chemicals Enterprises, South Africa), hexadecytrimethylammonium bromide 99 % (Aldrich, USA), hydrochloric acid 32 % (Merck, Germany), n-hexane 98 % (Glassworld, South Africa), diethyl ether 99.8 % (Aldrich, USA), CDCl3-d1 99.8 % atom D (Aldrich, USA), 2-pyridinecarboxaldehyde 99 % (Aldrich, USA), 3-pyridinecarboxaldehyde 98 % (Aldrich, USA), 4-pyridine-carboxaldehyde 97 % (Aldrich, USA), methanol 99.5 % (Associated Chemical Enterprise, South Africa), dichloromethane 99 % (Aldrich, USA), N,N-dimethylformamide 99.8 % (Aldrich, USA), toluene 99.9 % (Promark Chemicals, South Africa) and chloroform 99 % (Merck, Germany). Nitrogen 5.0, gas technical grade (Airflex Industrial Gases, South Africa), hydrogen gas 5.0 (Air Products, South Africa) Silica gel 60, 0.063-0.2 mm/70-230 mesh (Merck, Germany), aluminium-coated TLC plates, Müeller-Hinton agar (Scharlab) and nutrient broth (Scharlab). 1H- and 13C-NMR spectra were recorded on BRUKER 400 MHz spectrometer (AVANCE111 400) in CDCl3. Chemical shift values are reported in ppm and coupling constants in Hz. 1H-NMR spectra were referenced internally using residual protons in the deuterated solvent (CDCl3: δ = 7.24 ppm) and values reported relative to tetramethylsilane (δ = 0.00 ppm). 13C-NMR spectra were similarly referenced internally to the solvent resonance (CDCl3: δ = 77.0) with values reported relative to tetramethyl-silane (δ = 0.0 ppm). The infrared spectra were recorded using a PerkinElmer spectrum 100 FT-IR spectrometer and the data are reported as percentage transmittances at given wavenumbers. High-resolution electro-spray ionization (ESI) mass spectrometry spectra were recorded using a Waters Micromass LCT Premier TOF-MS. Only the molecular ions (M+) and the major fragmentation peaks are reported. The intensities are quoted as percentages of the base peak. UV-Vis spectra were recorded on a PerkinElmer Lambda 35 UV/VIS spectrophotometer in methanol, dichloromethane, toluene, N,N-dimethylformamide or chloroform. The emissions on the other hand were recorded on PerkinElmer LS55 Fluorescence spectrometer in methanol, dichloromethane, N,N-dimethylformamide or chloroform. All melting points were determined using Stuart Scientific melting point apparatus (SMP10) and co-related with those from the DSC instrument and are uncorrected. DSC thermal analyses were conducted on a SDT Q600 V20.9 Build 20, Universal V4.7A TA Instrument. The samples were heated from room temperature to 600 °C at a rate of 5 °C min-1 under nitrogen atmosphere with a gas flow rate of 50 mL min-1. Prior to analysis, the DSC was calibrated with sapphire calibrant while temperature was calibrated using indium and zinc standards. 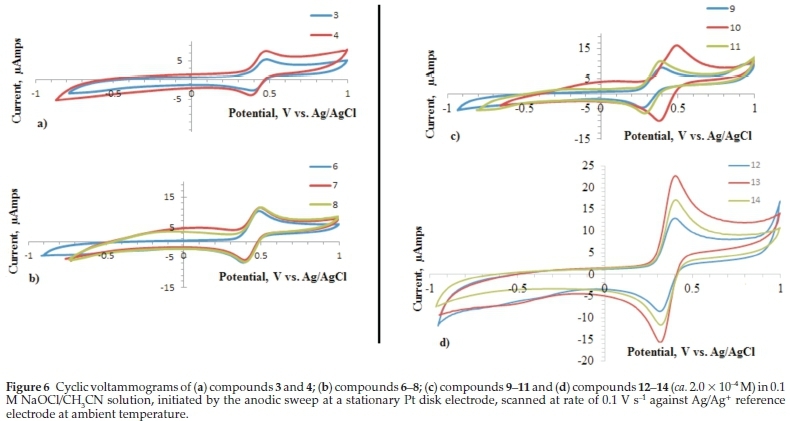 Cyclic voltam-mograms were performed using a Metrohm 797VA Computrace electrochemical analyzer with a one compartment three electrode system consisting of Ag/AgCl2 (0.01 M) reference electrode, platinum wire auxiliary electrode and platinum disc working electrode. Samples (ca. 0.1 mM) were prepared in acetonitrile and data aquired at a sweep rate of 100 mV s-1 under nitrogen atmosphere at ambient temperature. Sodium perchlorate (0.1 M) was used as the background electrolyte. Solutions were saturated with nitrogen by bubbling nitrogen gas for 5 min prior to each run. A standard protocol, the platinum disc working electrode was thoroughly polished between runs. The reference and auxiliary electrodes were also rinsed between runs. The ferrocenyl-N-(pyridinylmethylene)anilines 3-8 were synthesized by grinding ferrocenylaniline, compound 1 or 2 in combination with apposite pyridinecarboxaldehyde in a pyrex tube fitted with ground joint and a side arm.65 Grinding for 2-10 min resulted in a paste or in some cases a gummy melt that was dried under reduced pressure to get product as a dry solid. All the physical and spectral data for the known compound, 4-pyridylimine-4'-phenylferrocene (5), i.e. colour, m.p, 1H- and 13C-NMR were in line with the ones previously reported.21 Experimental data for the novel compounds 3, 4, and 6-8 are reported in the subsequent subsections 2.2.1 to 2.2.5. 4-Ferrocenylaniline (1) (0.3004 g, 1.08 mmol) and pyridine-2-carboxyaldehyde (0.1140 g, 1.06 mmol). The reaction yielded an orange yellow solid that was recrystallized in methanol layered with hexane and this provided orange crystals suitable for X-ray crystallography. Yield 0.3461 g, 89 %, m.p. 138-140 °C, DSC peak m.p. 141.41 °C. DHf = 4.55 x 106 J mol-1. DSf = 1.1x104 J mol-1 K-1. Calc. for C22H18N2Fe: M+ = 366.0819. Found [M+] 366.0825. FT-IR (cm-1): 3084, 1630, 1567, 1521, 1468, 1281, 816, 503 488.1H-NMR (400 MHz, CDCly δ ppm): δ = 8.69 (2H, m, C5H4N), 8.22 (1H, d, J = 7.8 Hz, -CH=N), 7.81 (1H, t, J = 7.5 Hz, C5H4N), 7.51 (2H, d, J = 8.0 C6H4), 7.34 (1H, d, J = 5.4 Hz, C5H4N), 7.27(2H, m, C6H4),4.65 (2H, t, J = 1.8 Hz, C5H4),4.32 (2H, t, J = 1.8 Hz, C5H4), 4.04 (5H, s, C5H5) ppm. 13C-NMR (400 MHz, CDCl3, δ ppm): δ = 152.67 (-CH=N-), 149.70 (C5H4N), 143.44 (C6H4), 136.69 (C5H4N), 136.11 (C5H4N), 129.92 (C6H4), 126.80 (C5H4N), 124.99 (C6H4), 121.82 (C5H4N), 121.44 (C6H4), 84.76 (C5H4), 69.65 (C5H4), 69.39 (C5H4), 69.11 (C5H4), 66.48 (C5H5) ppm. 4-Ferrocenylaniline (1) (0.3000 g, 1.08 mmol) and pyridine-3-carboxaldehyde (0.1132 g, 1.06 mmol). The productwas vacuum dried and gave an orange-yellow solid. Recrystallization in di-chloromethane/methanol solution gave orange crystalline plates suitable for X-ray crystallography. Yield 0.3579 g, 92 %, m.p. = 146-148 °C, DSC peak m.p. 146.71 °C, DHf = 6.81 x 106 J mol-1, DSf = 1.61x104 J mol-1 K-1. Calc. for C22H18N2Fe: [M+]=366.0819.Found [M+]=366.0818.FT-IR(cm-1):3089,2876, 1901, 1623, 1411, 1324, 1281, 821. 1H-NMR (400 MHz, CDCl3, δ ppm): δ = 9.05 (1H, s, C5H4N), 8.72 (1H, s, C5H4N), 8.56 (1H, s, -CH=N), 8.30 (1H, d, J = 7.8 Hz, C5H4N), 7.50 (2H, d, J = 8.4 Hz, C6H4), 7.42 (1H, s, C5H4N), 7.19 (2H, d, J = 8.4 Hz, C6H4), 4.65 (2H, t, J =1.8 Hz, C5H4), 4.32 (2H, t, J = 1.8 Hz, C5H4), 4.40 (5H, s, C5H5) ppm. 13C-NMR (400 MHz, CDCl3, δ ppm): δ = 156.43 (-CH=N), 149.78 (C5H4N), 148.92 (C5H4N), 144.27 (C6H4), 138.21 (C5H4N), 134.77 (C6H4), 126.79 (C5H4N), 122.50 (C6H4), 121.14 (C6H4), 84.71 (C5H4), 69.66 (C5H4), 69.43 (C5H4), 69.12 (C5H4), 66.45 (C5H5) ppm. 3-Ferrocenylaniline (2) (0.3020 g, 1.09 mmol) and pyridine-2-carboxyaldehyde (0.1144 mg, 1.07 mmol). Yield 0.3658 g, 94 %, m.p = 93-94 °C, DSC peak m.p. 93.91 °C, DHf = 6.89 x 106 J mol-1, DSf = 1.88 x 104Jmol-1 K-1. Calc. for C22H18N2Fe: [M+] = 366.0898. Found [M+] = 366.0840. FT-IR (cm-1): 3089,2876,1900,1623,1411, 1324.1H-NMR (400 MHz, CDCl3, δ ppm): δ = 8.72 (1H, d, J = 4.3 Hz, C5H4N), 8.66 (1H, s, C5H4N), 8.22 (1H, d, J = 7.9 Hz, C5H4N), 7.82 (1H, td, J = 7.6 Hz, J = 1.4 Hz, C5H4N), 7.39 (3H, m, C6H4), 7.32 (1H, t, J = 7.7 Hz, C6H4), 7.11 (1H, s, -CH=N), 4.67 (2H, t, J = 1.6 Hz, C5H4), 4.32 (2H, t, J = 1.6 Hz C5H4), 4.04 (5H, s, C5H5). 13C-NMR (400 MHz, CDCl3, δ ppm): δ = 160.58 (-CH=N-), 154.60 (C5H4N), 151.08 (C6H4), 149.76 (C5H4N), 140.65 (C5H4N), 136.76 δ = (C5H4N), 129.20 (C6H4), 127.87 (C6H4), 125.20 (C6H4), 124.522 (C5H4N), 122.00 (C6H4), 118.98 (C6H4), 69.46 (C5H4), 69.10 (C5H4), 66.57 (C5H5) ppm. 3-Ferrocenylaniline (2) (0.3000 g, 1.08 mmol) and pyridine-3-carboxyaldehyde (0.1136 g, 1.06 mmol). Yield 0.3650 g, 94 %; m.p. = 95-96 °C, DSC peak m.p 96.16 °C, DHf = 4.3x106 J mol-1, DSf = 1.15x104 J mol-1K-1. Calc. for C22H18N2Fe: [M+] = 366.0819. Found [M+] = 366.0807. FT-IR (cm-1): 3089,2876, 1900, 1623, 1411, 1324. 1H-NMR (400 MHz, CDCl3, δ ppm): δ = 9.03 (1H, s, C5H4N), 8.70 (1H, s, C5H4N), 8.53 (1H, s, C5H4n), 7.37 (4H, m, C6H4), 7.03 (1H, s, -CH=N), 4.67 (2H, t, J = 1.8, C5H4), 4.32 (2H,t, J = 1.8Hz,C5H4),4.05(5H,C5H4)ppm.13C-NMR(400MHz, CDCl3, δ ppm): δ = 157.98 (-CH=N), 151.11 (C5H4N), 150.63 (C5H4N), 142.81 (C6H4), 140.82 (C5H4N), 129.27 (C6H4), 124.80 (C5H4N), 122.32 (C6H4), 119.02 (C6H4), 117.72 (C6H4), 84.56 (C5H4), 69.68 (C5H4), 69.18 (C5H4), 66.60 (C5H5) ppm. 3-Ferrocenylaniline (2) (0.3017 g, 1.09 mmol) and pyridine-4-carboxyaldehyde (0.1141 mg, 1.06 mmol). Yield 0.3721, 95 %: m.p = 125-126 °C, DSC peak m.p 127.68 °C, DHf = 2.7 x 106Jmol-1, DSf = 6.77x 103J mol-1K-1. Calc. for C22H18N2Fe: [M+] = 366.0819. Found [M+] = 366.0813. FT-IR (cm-1): 3089, 2876,1900, 1623,1411,1324.1H-NMR (400MHz, CDCl3,δ ppm): δ = 8.76 (2H, s, C5H4N), 8.47 (1H, s, -CH=N), 7.77 (2H, s, C5H4N), 7.32 (3H, m, C6H4) 7.04 (1H,s, C6H4), 4.67 (2H, t, J = 1.8 Hz, C5H4), 4.32 (2H, t, J = 1.8 Hz, C5H4) 4.04 (C5H5) ppm. 13C-NMR (400 MHz, CDCl3, δ ppm): δ = 157.98 (-CH=N), 151.11 (C6H4), 150.63 (C5H4N), 142.81 (C5H4N), 140.81 (C6H4), 129.27 (C6H4), 124.80 (C6H4), 122.32 (C6H4), 119.02 (C6H4), 117.72 (C6H4N), 69.69 (C5H4), 69.17 (C5H4), 66.60 (C5H5) ppm. The Schiff bases 3-8 were reduced to their corresponding secondary amines using NaBH4 over solid neutral Al2O3 support via grinding under solvent-free conditions.66 The NaBH4 and neutral Al2O3 solid-phase mixture was prepared in a porcelain mortar by grinding neutral alumina (2.0 g, 20 mmol) with sodium borohydride (0.34 g, 9.0 mmol) for 5 min. Thereafter, appropriate imine (1.0 mmol) was added followed by addition of five drops of 99 % methanol. The grinding was continued intermittently and the progress of each reaction was monitored by the TLC using dichloromethane. Once all the substrate reacted, (45-60 min), the reaction mixture was poured into 20.0 mL of dichloromethane and filtered through a sintered glass funnel. The residue was washed further with two 15.0 mL portions of the same solvent. The solvent from the filtrate containing the product was evaporated and product purified via column chro-matography to obtain the secondary amine. All these amine derivatives are new and their experimental characterization data are given in the subsequent subsections 2.3.1 to 2.3.6. Compound 3, (0.3662 g, 1 mmol). Recrystallization in methanol gave orange plates suitable for X-ray crystallography. Yield 0.3360 g, 92 %, m.p. = 184-186 °C, DSC peak m.p 184.76 °C, DHf = 3.34 x 106Jmol-1, DSf = 7.23 x 103Jmol-1 K-1. Calc. for C22H20N2Fe: [M+] = 368.0976. Found [M+] 368.0975. FT-IR (cm-1): 3343, 3082, 2882, 1611, 1594, 1532, 1323, 1293. 1H-NMR (400 MHz, CDCl3, δ ppm): δ = 8.58 (1H, d, J = 3.6 Hz, C5H4N), 7.64 (1H, t, J = 7.5 Hz, C5H4N), 7.34 (1H, d, J = 7.7 Hz, C5H4N), 7.29 (2H, d, J = 8.1 Hz, C6H4), 7.18 (1H, t, J = 5.4 Hz, C5H4N), 6.60 (2H, d, J = 8.1 Hz, C6H4), 4.48 (4H, m, C5H4), 4.20 (2H, s, -CH2-) 4.00 (5H, s, C5H5) ppm. 13C-NMR (400 MHz, CDCl3, δ ppm): δ = 149.89 (C5H4N), 142.5 (C6H4) 136.73 (C6H4N), 127.20 (C5H4N), 122.16 (C6H4N), 121.68 (C6H5),113.10(C6H4), 69.36 (C5H4), 68.11 (C5H4), 65.77 (C5H5), 49.43 (-CH2-) ppm. Compound 4 (0.366 g, 1 mmol). Recrystallization in methanol gave golden yellow plates. Yield 0.3421 g, 93 %, m.p. 172-174 °C; DSC peak m.p. 174.70 °C, DHf = 4.572 x 106 J mol-1, DSf = 1.02 x 104 J mol-1 K-1 Calc. for C22H20N2Fe: M+ = 368.0976. Found [M+] = 368.0985. FT-IR (cm-1): 3393, 3260, 3079, 2860, 1611, 1533, 1315, 1293,1251,1186.1H-NMR (400MHz, CDCl3,δ ppm): δ = 8.67(1H, s, C5H4N), 8.55 (1H, s, C5H4N), 7.70 (1H, d, J = 7.7 C5H4N), 7.27 (3H, m, 1H- C5H4N, 2H- C6H4), 6.56 (2H, d, J = 8.5 Hz, C6H4), 4.51 (2H, t, J = 1.8 Hz, C5H4), 4.36 (2H, s, -CH2-), 4.21 (2H, t, J = 1.8, C5H4), 4.00 (5H, s, C5H5) ppm. 13C-NMR (400 MHz, CDCl3, δ ppm): δ = 149.2 (C6H4), 148.75 (C5H4N), 145.98 (C6H4N), 135.18 (C5H4N), 128.55 (C5H4N), 127.24 (C6H4), 113.05 (C6H4), 86.58 (c5H4), 69.38 (C5H4), 68.21 (C5H4), 65.79 (C5H5), 46.03 (-CH2-) ppm. Compound 5, (0.366 g, 1 mmol) used. Recrystallization in methanol gave shinny orange plates suitable for X-ray crystallography. Yield 0.3533 g, 96 %, m.p = 189-191 °C, DSC peak m.p 191.31 °C, ∆Hf = 3.84 x 106 J mol-1, ∆Sf = 8.28 x 103 J mol-1 K-1. Calc. for C22H20N2Fe: [M+], 368.0976. Found [M+] 368.0961. FT-IR(cm-1): 3324,3086, 2917,1603,1535,1417,1283.1H-NMR (400 MHz, CDCl3 δ ppm): δ = 8.58 (2H, d, J = 4.0 Hz, C5H4N), 7.32 (2H, d, J = 4.0 Hz, C5H4N), 7.28 (2H, dd, J = 6.7 Hz, J = 1.8 Hz, C6H4), 6.51 (2H, d, J = 8.6 Hz, C6H4), 4.50 (2H, t, J = 1.8 Hz, C5H4), 4.37 (2H, s, -CH2-), 4.21 (2H, t, J = 1.8 Hz, C5H4) 4.0 (5H, s, C5H5). 13C-NMR (400 MHz, CDCl3, δ ppm): δ = 149.97 (C5H4N), 147.6 (C6H4), 144.63 (C5H4N), 139.24 (C6H4), 127.25 (C6H4), 122.21 (C5H4N), 112.97(C6H4), 69.37 (C5H4),, 68.21(C5H4), 65.81(C5H5), 47.31 (-CH2-) ppm. Compound 6 (0.366 g, 1 mmol) used. Recrystallization in methanol gave orange blocks. Yield; 0.3390 g, 92 %, m.p = 110-112 °C, DSC peak m.p 111.79 °C, DHf = 9.27 x 106 J mol-1, ∆Sf = 8.29 x 104 J mol-1 K-1..Calc. for C22H20N2Fe: [M+] 368.0976. Found [M+]. 368.0984. FT-IR (cm-1): 3362, 3014, 1730, 1603, 1585, 1521, 1434, 1418, 1246, 1144, 1045. 1H-NMR (400 MHz, CDCl3 δ ppm): 8.59 (1H, s, C5H4N), 7.63 (1H, d, J = 7.3 Hz, C5H4N), 7.36 (1H, d, J = 7.6 Hz, C5H4N), 7.17 (1H, d, J = 5.1 Hz, C6H4), 7.08 (1H, t, J = 7.7 Hz, C5H4N), 6.83 (1H, d, J = 7.3 Hz, C6H4), 6.76 (1H, s, C6H4), 6.51 (1H, d, J = 7.5 Hz, C6H4), 4.55 (2H, t, J = 1.8 Hz, C5H4), 4.45 (2H, s, -CH2-), 4.23 (2H, t, J = 1.8 Hz, C5H4), 3.97 (5H, s, C5H5) ppm. 13C-NMR (400 MHz, CDCl3, δ ppm): δ = 158.74 (C5H4N), 149.02 (C6H4), 147.79 (C5H4N), 140.12 (C5H4N), 136.78 (C5H4N), 129.12 (C6H4), 122.19 (C5H4N), 121.66 (C6H4), 116.14 (C6H4), 111.16 (C6H4), 111.01 (C6H4), 86.04 (C5H4), 69.56 (C5H4), 68.64 (C5H4), 66.61 (C5H5), 49.42 (-CH2-) ppm. Compound 7 (0.366 g, 1 mmol) used. Recrystallization in methanol gave deep orange blocks. Yield; 0.3240 g, 88 %, m.p = 88-90 °C. Calc. for C22H20N2Fe: [M+] 368.0976. Found [M+].368.0981. FT-IR(cm-1): 3267, 3096, 2920, 1723, 1602, 1536, 1460, 1423, 1309, 1236, 1103, 1024.1H-NMR (400 MHz, CDCl3 δ ppm): δ =8.67 (1H, s, C5H4N), 8.53 (1H, s, C5H4N), 7.72 (1H, d, J = 6.8 Hz, C5H4N), 7.28 (1H, s, C5H4N), 7.07 (1H, t, J = 7.6 Hz, C6H4), 6.85 (1H, d, J = 7.2 Hz, C6H4), 6.69 (1H, s, C6H4), 6.46 (1H, d, J = 7.4 Hz, C6H4), 4.52 (2H, t, J = 1.8 Hz, C5H4). 4.39 (2H, s, -CH2-), 4.24 (2H, t, J = 1.8 Hz, C5H4), 3.97 (5H, s, C5H5) ppm. 13C-NMR (400 MHz, CDCl3, δ ppm): δ = 149.12(C6H4),148.68(C5H4N),147.50(C5H4N), 140.30 (C5H4N), 135.16 (C5H4N), 129.19 (C6H4), 123.10 (C5H4N), 120.00 (C6H4 ), 116.55 (C6H4), 111.00 (C6H4), 85.81 (C5H4), 69.60 (C5H4), 68.73 (C5H4), 66.61 (C5H5), 45.95 (-CH2-) ppm. Compound 8, (0.366 g, 1 mmol) used. Recrystallization in methanol gave orange blocks suitable. Yield 0.3136 g, 85 %; m.p = 141-143 °C. Calc. for C22H20N2Fe: [M+] 368.0976. Found [M+]. 368.0981. FT-IR(cm-1): 3375, 2919, 2850, 1726, 1586, 1456, 1417, 1246, 1068, 1024. 1H-NMR (400 MHz, CDCl3 δ ppm): δ = 8.75 (1H, s, C5H4N), 8.60 (1H, s, C5H4N), 7.77 (1H, d, J = 6.0 Hz, C5H4N), 7.32 (1H, s, C6H5), 7.08 (1H, t, J = 7.5 Hz, C5H4N), 6.9 (1H, d, J = 7.6 Hz, C6H5), 6.71 (1H, s, C6H5), 6.47 (1H, d, J = 7.6 Hz, C6H5), 4.53 (2H, t, J = 1.8 Hz, C5H4), 4.41 (2H, s, -CH2-), 4.24 (2H, t, J = 1.8 Hz, C5H4), 3.97 (5H, s, C5H4) ppm. 13C-NMR (400 MHz, CDCl3, δ ppm): δ = 149.12(C5H4N),148.68(C6H4),147.51 (C5H4N), 140.30 (C5H4N), 135.16 (C6H4), 129.19 (C6H4), 116.55 (C6H4), 111.00 (C6H5), 110.8 (C6H4), 85.88 (C5H4), 69.60 (C5H4), 68.73 (C5H4), 66.61 (C5H5), 45.95 (-CH2-) ppm. A single crystal of either compound 4,9,10 and 11 was selected and attached onto the tip of glass fibres using epoxy glue. The crystals were mounted on a Mitegen Micromount and centred in the X-ray beam by using a video camera. The crystal evaluation and data collection were done on a Bruker Smart APEX2 diffractometer with Mo Ka radiation (l = 0.71073 A) equipped with an Oxford Cryostream low temperature apparatus operating at 100 K. The initial cell matrix was determined from three series of scans consisting of twelve frames collected at intervals of0.5°ina6°range with the exposure time of ten seconds per frame. Each of the three series of scans was collected at different starting angles and the APEX2 program suite was used to index the reflections.67 The data collection involved using omega scans of 0.5 ° width with an exposure time of 20 seconds per frame. The total number of images was based on results from the program COSMO, whereby the expected redundancy was to be 4.0 and completeness of 100 % out to 0.75 A. Cell parameters were retrieved using APEX2 and refined using SAINT on all observed reflections. Data reduction was performed using the SAINT.67 software and the scaling and absorption corrections were applied using SADABS68multi-scan technique. The structures were solved by the direct method using the SHELXS program and refined.68 The visual crystal structure information was performed using ORTEP-3 system software.69 Non-hydrogen atoms were first refined isotropically and then by anisotropic refinement with full-matrix least squares method based on F2using SHELXL.68 All hydrogen atoms were positioned geometrically, allowed to ride on their parent atoms and refined isotropically. 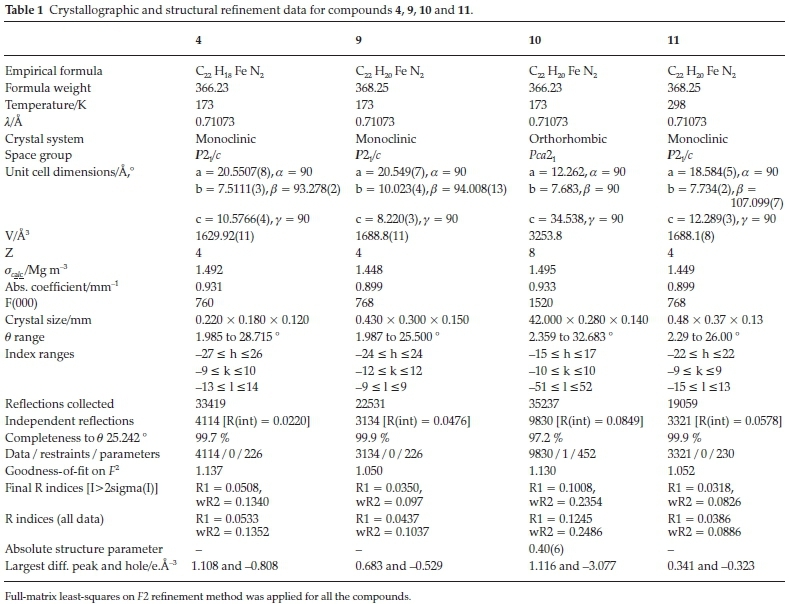 The crystal data and structural refinement information are summarized in Table 1. All data were subjected to the online checkCIF evaluation criteria. Inoculation of the microorganism used was done in nutrient broth after sterilization. Nutrient broth (1.3 g) was dissolved in distilled water (100 mL). Approximately 10 mL portions of the nutrient broth solution were poured into test tubes. The test tubes were closed with cotton wool plugs which were wrapped with aluminium foil and then sterilized by autoclaving at 121 °C for 15 min. The broth was allowed to cool to 37 °C after which the microorganisms were inoculated. Inoculation was done via sterilized cotton swab. The inoculums were incubated at 37 °C for 24 h.
Müller-Hinton agar (38 g) was dissolved in distilled water (1 L). The resulting agar medium was sterilized by autoclaving at 121 °C for 15 min and thereafter allowed to cool in a water bath set at 45 °C. After cooling, approximately 25 mL of the agar medium were poured into previously washed and sterilized flat-bottomed glass petri dishes to give a uniform depth of approximately 4 mm. The agar medium was allowed to cool to room temperature (ca. 25 °C) and set. The test organisms were then struck on the surface of the agar medium using wire loops sterilized by heating red hot in a flame that was then cooled. The paper discs containing the 20 of compound under investigation were then loaded onto the already-inoculated agar plates using sterilized forceps and then incubated at 37 °C for 24 h. The diameter of the zone of inhibition was measured around the disc. A representative sample of each batch of plates without any microorganism was also incubated at the same temperature for 24 h to examine for sterility. Viability of the organisms was tested by incubating test plates without the compounds being investigated. Chloramphenicol was used as the standard antibacterial agent whereas fluconazole was used in the technique as the standard antifungal agent. The ferrocenyl-N-(pyridinylmethylene)anilines, compounds 3-8, were obtained via condensation of 3- or 4-ferrocenylanilines with appropriate pyridinecarboxaldehydes (Schemes 1 and 2). The reactions were carried out by grinding of the reactants under solvent-free conditions in a quartz tube. 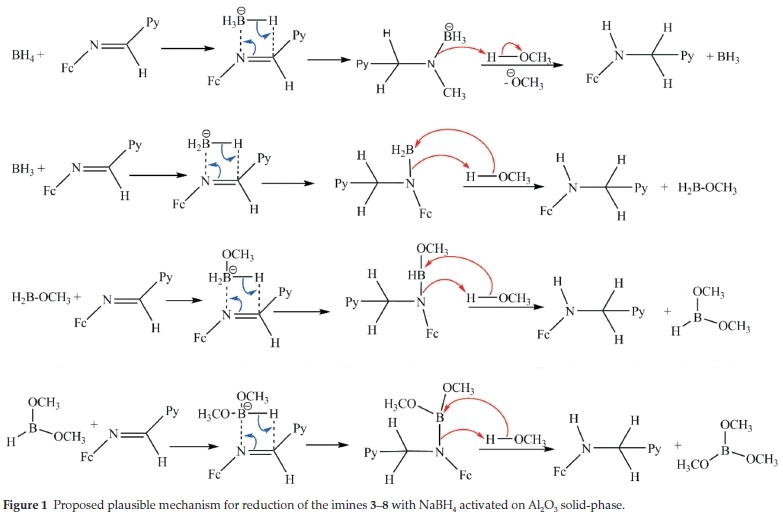 Progresses of reactions for the formation of Schiff bases were monitored by FT-IR. The obtained melts and in some cases pastes were dried under vacuum to obtain the final product in excellent yields. All the im-ines except compound 5, are new and have not been reported before. The amine derivatives compounds 9-14 synthesized here are all new and have not been reported. These compounds were obtained in excellent yields by solvent-less reduction of corresponding imines via the mechanochemistry technique.66 The imine derivatives were ground on NaBH4 supported on neutral Al2O3 solid-phase and the reaction proceeded via the proposed plausible mechanism shown in Fig. 1. The product was extracted by dichloromethane and thereafter purified through column chromatography. Progress of reactions for the formation of the secondary amine derivatives was monitored by FT-IR, as well as TLC on aluminium-coated plates. Synthesis techniques employed here are ecologically benign and also offer considerable synthetic advantages in terms of yield, selectivity, time and simplicity of the reaction procedure. The synthesized anilines show N-H stretching absorption bands at 3396 and 3217 cm-1 characteristic of the aromatic amines. These N-H stretching bands are absent in the corresponding Schiff bases formed. Hence, the complete disappearance of the N-H stretching band as well as that of the aldehyde C=O stretching band at 1708 to 1699 cm-1 and the corresponding appearance of C=N sp2stretching bands ranging from 1623 to 1630 cm-1 confirms the formation of the Schiff bases 3-8. 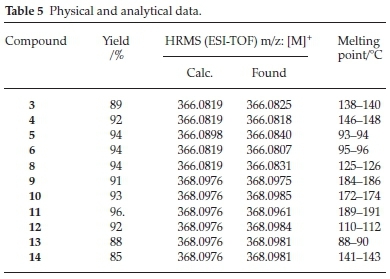 These characteristic stretching frequencies of the ferrocenyl-N-(pyri-dinylmethylene)anilines Schiff bases are consistent with those reported for similar compounds and theoretical expectations.21,70,71 Important infrared absorption bands along with their band assignments are listed in Table 2. All the amine derivatives show a medium frequency stretching band between 3260 and 3362 cm-1 assigned to the secondary amine N-H stretch. Moreover, the amine derivatives show stretching frequencies ranging from 1023 to 1188 cm-1 that were assigned to the stretching band of secondary amine C-N sp3bond. These secondary amine stretching frequencies are lower than their corresponding C=N sp2 stretching frequencies. This is expected since the amine bonds are much weaker when compared to the imine bonds and thus the former require lesser energy to stretch. The amines also show a stretching band ranging between 3000 and 2840 cm-1, characteristic to C-H stretch of the sp3methylene group. These compounds show characteristic absorption peaks for Fe-Cp stretching vibrations ranging from 479 to 490 cm-1. These infrared stretching bands are not unusual and have been observed in other ferrocenyl Schiff bases.9 The condensation reaction leading to formation of the Schiff bases and the structural assignments were further supported by the 1H-NMR spectra for compounds 3-8 where the imine N=CH- proton peak appears in the aromatic region. These peaks corresponds to up-field shift of the aldehyde peak of the pyridinecarboxaldehydes from 10.5 ppm, to 7.2-8.5 ppm in the imines. Upon reduction of imines 3-8 to their corresponding amines 9-14, major upfield shifts in peaks for almost all the protons are observed. Upon conversion of the imine to amine, the proton peaks for the sp2methine group, =CH-, are shifted upfield to ca 4.4 ppm, characteristic to sp3methylene group -CH2-. In compound 10 for instance, these proton are now observed at 4.36 ppm and their peak integrates to two protons. The protons on the alpha carbon atoms of phenyl ring (with respect the amino group) now resonate at 6.56 ppm down from 7.50 ppm. The alpha protons of the pyridine ring (with respect to the substitution and N atom) resonate at 8.67 ppm in compound 10, down from 9.05 ppm in compound 4. All the other amines show similar trends in shift of proton peaks. There is also an upfield shift of the imine carbon peaks to 46.03 ppm in compound 10 from 156.43 ppm in compound 4. This is in agreement with the conversion of the carbon from the sp2to sp3after reduction. Similarly, the amine carbon peaks in the other ferrocenyl-N-(pyridinylmethyl)anilines 9, 11-15 appear between 45-50 ppm. As expected, these carbon atoms exhibit negative peaks in the DEPT 13C-NMR in the same position (ppm). The ESI mass spectrum of each of these compounds showed a molecular ion peak (100 %) that corresponds to the mass parent molecule. No major fragmentations were recorded. These data correlate well with that reported in literature for ferrocenyl compounds having secondary amine functional groups.29 The absolute structures of some of these compounds were confirmed by X-ray crystallography technique as discussed in Section 3.3. Single crystals for X-ray analysis for compound 4 were grown in dichloromethane/methanol while those of compounds 9, 10 and 11 were obtained from methanol, all as orange plates. The asymmetric unit for compound 10 contains two independent molecules related by an inversion centre, similar to that reported in the crystal structure of compound 5.21On the other hand, the asymmetric units in compounds 4,9 and 11 each contain a single molecule. The two molecules in the structure of compound 10 have different conformations. Each of these compounds bears a ferrocenyl imine moiety (from the starting ferrocenyl aniline) and a methyl pyridinyl moiety from the starting pyridine carboxaldehyde forming the (E)-4-ferrocenyl-N-(pyridinyl-3-methylene)aniline Schiff base 4, and ferrocenyl-N-(pyri-dinylmethyl)anilines, compounds 9-11 on reduction of the respective Schiff bases. 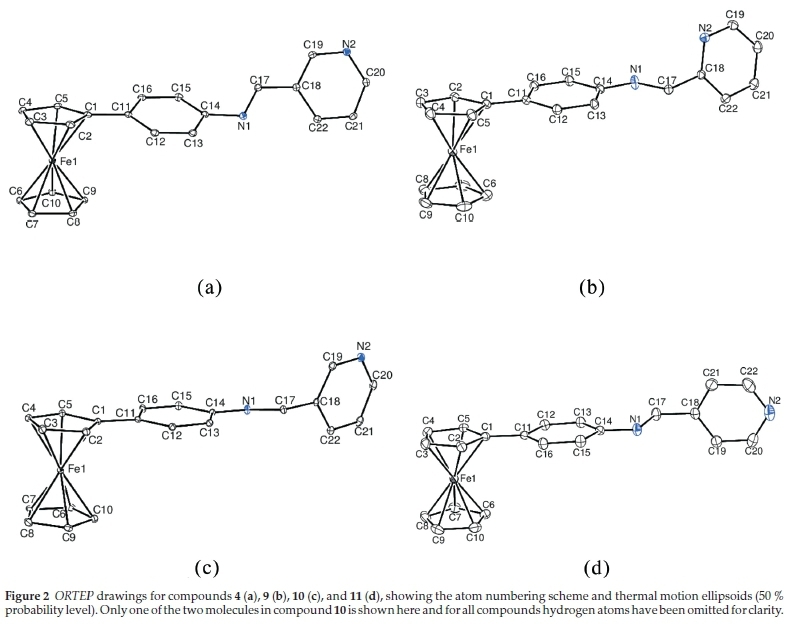 Figure 2 shows ORTEP diagrams for four compounds. The two moieties referred in Fig. 2 seem to be the two main sets of planes that describe the conformations in some of the four compounds discussed here. The dihedral angles between these two planes seem to differ from compound to compound and in compound 10, between the two molecules in the crystal structure. In the structure of compound 10 the dihedral angle between the two molecules 89.011(0.082) ° in one and 84.129(0.089) ° in the second. 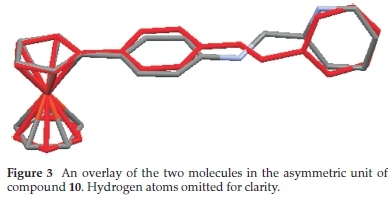 The difference in the conformations of the two molecules is further depicted in the molecule overlay diagram in Fig. 3. The root mean square deviation of one from the other molecule is 0.0748 A. In the overlay it is also evident that the methyl pyridinyl moiety is twisted by about 180 ° in the second molecule. 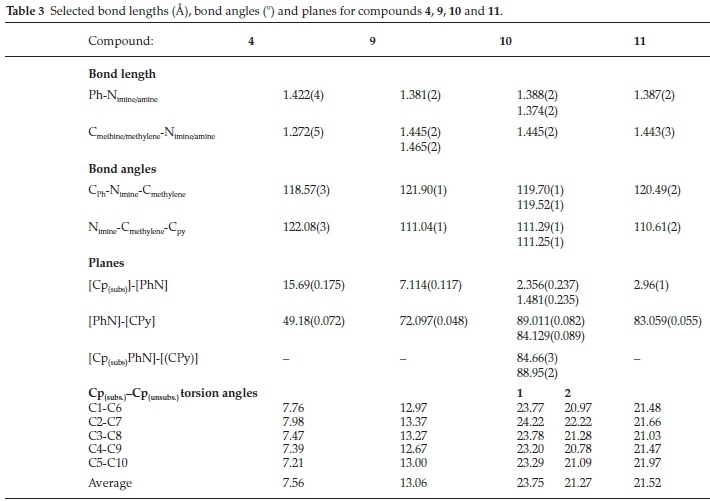 Fundamental bond lengths, angles, planes and interactions are presented on Table 3. The C-Nimine and Nimine-CPh bond distances in 4 are significantly different from those in 9-11 as expected. In compound 4, the C-Nimine bond distance is 1.276(5) A while the Nimine-CPh is 1.422(4). The corresponding bond distances, i.e. C-Namine and Namine-CPh in 9-11 are much longer than those in compound 4. The C-Namine distances are 1.445(2) and 1.465(2) A for the two molecules in 10,1.445(2) and 1.443(3) A in 9 and 11, respectively. The Namine-CPh distances are 1.388(2) and 1.374(2) A in 10,1.381(2) and 1.387(2) for compounds 9 and 11. Compounds 6 has an imine bond which has greater electron density in the inter-nuclei region that contribute to a stronger bond which is shorter whereas compounds 9-11 have single amino bond which relatively weaker and thus longer. 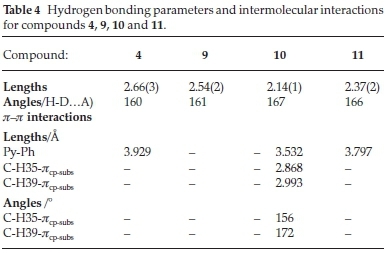 Table 4 lists important intermolecular interactions in compounds 4, 9, 10 and 11. The compounds also show non classical interactions yielding supramolecular structures. Compound 4 for instance shows significant intermolecular p-p interactions involving the pyridinyl and phenyl rings. Consequently, this orients the molecule in a manner leading to formation of C-H.. .N and p...p intermolecular interactions forming chains in which molecules are stacked in an alternating head-to-tail manner down b crystallographic axis. Compound 9 has N-H.N interactions down the c crystallographic axis: This interaction leads to the formation of a step-like supramolecular structure. Compounds 9 and 11 show reasonable intermolecular hydrogen bonding with bond distances of 2.54(3) and 2.37(2) A, respectively. The donor atoms are pyridinyl nitrogen atoms in both cases. This results in a step-like supramolecular structure in compound 9 and dimer in compound 11. The hydrogen bonding and stability of the dimer in compound 11 are further buttressed by intermolecular p-p interactions involving the pyridinyl rings. Compound 10, shows intermolecular p-p interactions between the pyridinyl and phenyl rings and C-H. p interactions involving the substituted Cp ring in one of the molecules. Despite having both the phenyl and pyridinyl moieties, in addition to the ferrocenyl group, the compounds reported have sharp melting points similar to ferrocenyl derivatives having only a single phenyl unit74 Ferrocenyl compounds having one longer axis where two phenyl units are linked to one Cp ring in series forming a chain generally show crystal-crystal phase transitions while those with three or more phenyl usually show liquid crystalline properties and crystal phase transitions.10,29,38,74 Compounds reported here lack these credentials (i.e. long linear shape and large length-depth ratio) to generate intermolecular interactions leading to mesomorphism. Therefore, the DSC data for compounds reported show a single key event, i.e. melting and subsequent decomposition. 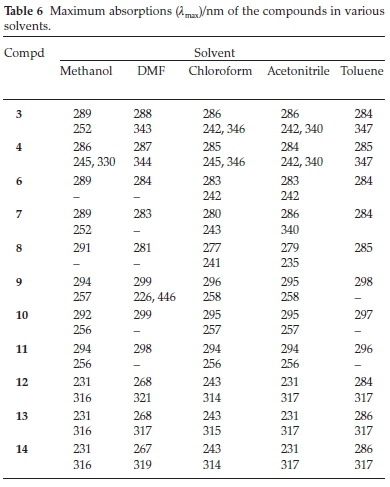 The data obtained for the compounds are listed in Table 5. The molecules for the imine derivatives from 3-ferrocenylaniline have lower melting points compared to those derived from the 4-ferrocenylaniline. Among, the imine derivatives from 3-ferrocenylaniline the melting points increase in the order compound 6 < 7 < 8. From these studies, it is also evident that the amine derivatives have higher melting points than their corresponding imines from which they were obtained. Therefore, the amines exhibit stronger intermolecular forces that might also be reinforced by hydrogen bonding like in compound 9. The position of the pyridine nitrogen and also the position of substitution on the phenyl ring (i.e. 3- or 4-ferrocenyl-aniline) influence the thermal properties of the compounds. The UV/Vis absorption and emission of the compounds were carried out in solution at room temperature. The metalloligands reported are soluble in a variety of organic solvents and this allowed detailed investigation of their solvatochromic behaviour. 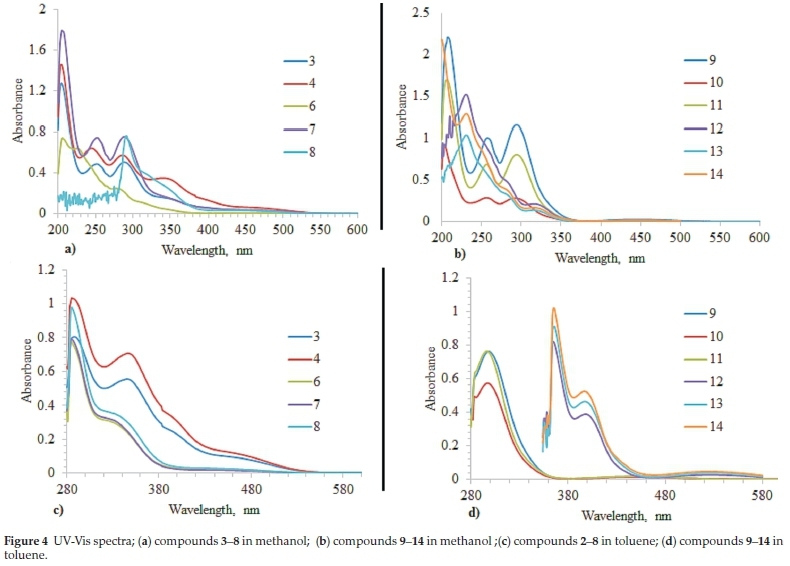 The solvatochromism characteristics were studied by measuring the UV-Vis spectra of compounds 3, 4 and 6-14 in polar (methanol, N,N-dimethylformamide), mid-polar (acetonitrile and chloroform), and nonpolar (toluene) solvents. As anticipated, in all solvents, all the compounds showed a bathochromic (red) shift in comparison to pristine ferrocene. The imines and amines displayed both n-p*and p-p* transitions60,75 in methanol. The stronger and higher energy peak were attributed to the p-p* transition of the Schiff base chromophores and the benzene ring while the weaker and less energetic peaks were assigned to the n-p*60 transition involving the promotion of the lone pair electron of imine nitrogen atom to the antibonding p orbital associated with the Schiff base group. Weaker bands appearing at longer wavelengths can be attributed to the d-d transitions. On changing solvent from nonpolar to polar, all the imines showed a bathochromic shift of p-p* transitions75 an indication of their non-linear optics character, a behaviour that has also been observed in other ferrocenyl imine derivatives.52,75, These spectral characteristics of the ferrocenyl-N-(pyridinylmethyl)anilines are attributed to the mixing of appreciable metal-to-ligand charge transfer (MLCT) character into their low-energy electronic excited states.76 This MLCT contribution originate from vectorial displacement of electron density from the metal to the ligand. Conjugation between the p orbitals of the cyclopentadienyl, phenyl and pyridyl rings allows the transferred charge to be delocalized over several atoms, consequently stabilizing the MLCT excited state relative to the ground state and lowering the transition energy. Also, the polar solvents lower the transition energy owing to the greater Coulombic stabilization of the dipolar (charge-separated) excited state. Increase in the intensity of the absorption bands is as a result of mixing charge transfer character into the transition thus reducing the Laporte forbidden character.76 The observed shifts of band maxima to higher energies in polar solvents point to presence of a polar ground state and nonpolar excited state in imines, i.e. compounds 3, 4 and 6-8. On the other hand, the amine compounds 9-14 showed hypsochromic shift77 when in polar solvent (methanol) compared to the non-polar (toluene), an indication of possible hydrogen-bonding between the compounds and polar solvent molecules. These compounds have a dipole involving the amino N atom and its H atom. The polar solvent increases the contribution of the polar unit of the molecule in the ground state. Upon transition, the dipole associated with the molecule is either reversed or rotated, subsequently this alteration leads to a hypsochromic shift (negative solvatochromism).77,78 The hypsochromic shift is consistent with diminished conjugation in the amine. The amines absorb at longer wavelengths when compared to their corresponding imines and this is due to change in the hybridization of N atom upon reduction. The solvatochromic behaviour of these compounds is well in line with the nonlinear optical properties (Table 6) and warrants further investigation and application. 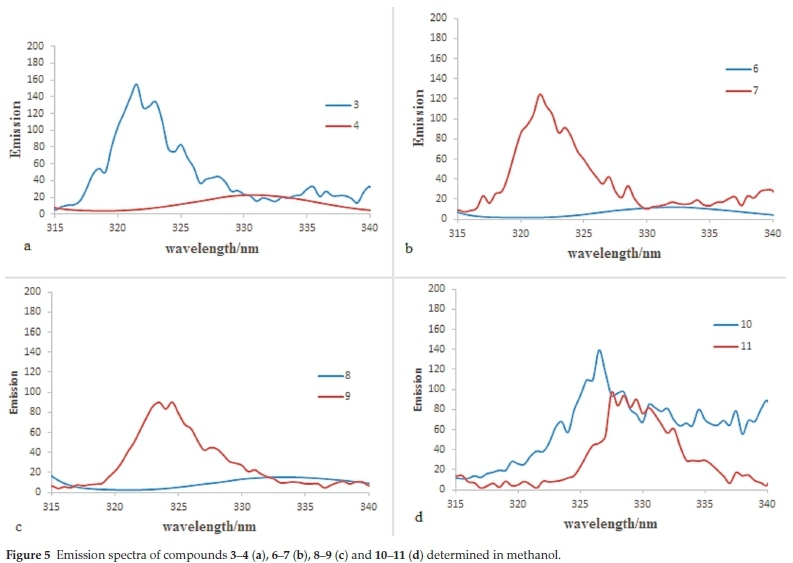 The absorption spectra of the compounds in methanol and toluene are shown in Fig. 4. The absorption maxima of these compounds in solvents with different polarities are summarized in Table 6. The emissions of the compounds 3, 4 and 6-14 were determined in various solvents at room temperature (298 K) and the maximum emissions are reported in Table 7. Ordinarily, aromatic ligands/heterocyclic compounds are not strongly emissive at room temperature.76 In addition, ferrocene does not show luminescence, because in its excited states, it undergoes very rapid electronic and vibrational relaxation to the ground state.76 However, in solution at room temperature, all the compounds studied here show broad emission bands, with large stoke shifts averaging between 28-30 nm. This is indicative of molecular fluorescence with short-lived excited states as deduced from the stable emissions.53 The stable emissions can be allied to the presence of a phenyl ring in the compounds which helps to obliterate nonradioactive decay of the intra-ligand p-p* transition. The emissions in the compounds stem from the p-p* transition emissions on the ferrocenyl moiety as well as the phenyl units.79 The results highlight the applicability of these compounds as fluorophores in detection and determination of absorbing species. The emission spectra of the compounds in methanol are shown in Fig. 5, while the emission maxima in various solvents are summarized in Table 7. The antimicrobial studies were carried out via the disc diffusion method. In this method, the standardized microorganisms isolate were spread on an agar plate. Thereafter, paper discs containing specific concentration of test compound were placed on the seeded agar and incubated at 37 °C for 24 h (see Section 2.5.2). The susceptibility of microorganisms to the test compounds was observed as a zone of inhibition around the discs (i.e. the microorganism does not grow around the disc thus forming a clear region). After incubation time, antimicrobial activity was evaluated by measuring the zone of inhibition against the test organisms and compared with that of the standard. Antimicrobial activities were expressed as inhibition diameter zones in millimetres (mm). The experiment was carried out in triplicate, and the average zone of inhibition was calculated. This was done for the test compounds 3-14, a negative control (DMSO) and positive controls (standard drugs). Fluconazole was used as the standard (positive control) for Candida albicans. This is because the fungus is highly susceptible the drug and thus is usually used as a positive control agent for the fungus.80-82 Fluconazole has been used as a standard drug in numerous Chloramphenicol is a broad-spectrum antibiotic and is effective against several bacteria including the ones used in this study and has been employed as a standard in similar studies.83-85 It was thus was selected as positive control agent for the bacteria species. The inhibition zones (i.e antimicrobial activity) of the test compounds 3-14 are reported in Table 9 as percentages relative to activity of the standard drugs used. The antimicrobial properties of compounds 3-14 were individually studied against the bacterial species Escherichia coli, Salmonella typhimirium, Staphylococcus aureus and fungal species Candida albicans. These were tested at a concentration of 20 μg/0.02 mL in DMSO solution using a paper-disc diffusion method. The solutions of the compounds under investigation in DMSO were used immediately after preparation. The experiment was carried out in triplicate, and the average zone of inhibition was calculated. The results of these studies indicate the compounds have variable activities against the test organisms, as shown in Table 9. In general, the compounds were more active towards the Gram-positive bacteria Staphylococcus aureus and fungus Candida albicans and showed lesser inhibition against the Gram-negative bacteria Escherichia coli and Salmonella typhimirium. Compound 14 showed high activity against all test organisms, with inhibitions >60 %. Compound 10 also showed good inhibitions, >60 %, against the test organisms except Escherichia coli where it showed 45 % inhibition. The fungus Candida albicans, was susceptible to all the compounds except compound 13 which showed no activity. Nitrogen heterocyclic ferrocenyl Schiff bases studied elsewhere showed similar biological activity like the one observed here.35] The information on the biological activity of ferrocene-containing Schiff base and amine compounds reported here warrants further investigation to ascertain their structure activity relationship. This could in turn help in the design of more similar compounds for biological applications. There are high prospects that this activity could be improved by complexation of biologically active metals with these ferro-cenyl-N-(pyridinylmethylene)anilines or ferrocenyl-N-(pyri-dinylmethyl)anilines metalloligands. This will offer a new class of bimetallic medicinal compounds that will go a long way in sustaining the fight against infectious and non-infectious diseases. Solvent-free grinding of ferrocenylaniline with a pyridine-carboxaldehyde yielded corresponding Schiff bases in excellent yields in a very short time. This reaction proceeded via the condensation reaction where water was eliminated. The mechano-chemistry grinding technique was also successfully applied in reduction of the Schiff bases to their corresponding secondary amines by use of NaBH4, activated on neutral Al2O3 support in solid phase. The desired amine products were obtained in excellent yields and also in very short time. Hence, this technique is cleaner, simpler, greener, timeous and pure products were achieved with minimum work-up. Characterization of the synthesized compounds was successfully performed using FT-IR, 1H-NMR, 13C-NMR and X-ray crystallography techniques. All data obtained are consistent with the proposed structures. Heat flow curves for these compounds show single major event of melting followed by decomposition. The melting temperature from DSC technique corresponds with those obtained from melting point apparatus. From the detailed solvatochromic studies performed, the compounds show a blue shift (compared to ferrocene) in moving from polar to non-polar solvent albeit the shift being smaller in the amines. These compounds are thus good candidates for further investigation as sensors and in molecular electronics for construction of molecular switches. Also, the nonlinear optical susceptibilities and hyperpolarizability of these compounds should be investigated. Electrochemical traits of all the compounds were studied relative to that of ferrocene by cyclic voltammetry. In all the compounds, one electron redox behaviour was observed. The voltammograms showed one cathodic peak and a corresponding anodic peak occurring at the platinum electrode in the range 0.2916-0.4642 V. Electrochemical studies reveal that the electron withdrawing imine group substantially influences the redox potential of the iron centre of ferrocene moiety compared to amine group. Based on the variation observed in the formal potential values of compounds 3-14, it can be concluded that the oxidation potential of the ferrocenyl oxidizing moiety, can be modified by changing the electronic properties of the substituents attached to the cyclopentadienyl ring via changing the imine to amine. Finally, these compounds show good inhibitory antimicrobial activity against fungus Candida albicans and Gram-positive bacterium Staphylococcus aureus and mild activity against Gram-negative bacteria Escherichia coli and Salmonella typhimirium in comparison with standard drugs. Improvement of the antimicrobial potency of the compounds reported here as well as other properties will be investigated further by coordination of selected transition metals to these metalloligands hence forming versatile multi-metallic complexes. To this end, we are pursuing synthesis of potent antimicrobial and anticancer compounds as well as non-linear optical compounds by complexation of selected transition metals using these compounds. We anticipate that the bimetallic compounds obtained thereafter will be of high utility in varying fields. CCDC1435546-1435549 contains the supplementary crystallographic data for this paper. These data can be obtained free of charge from The Cambridge Crystallographic Data Centre via www.ccdc.cam.ac.uk/data_request/cif. Supplementary Fig. S1 to Fig. S14 in the online supplement show the IR spectra of compounds 1-14, respectively; Fig. S15 to Fig. S26 show the ESI mass spectra of compounds 3-14, respectively; Fig. S27 to Fig. S40 show the 1H-NMR spectra of compounds 1-14, respectively; and Fig. S41 to Fig. S54 show the 13C-NMR spectra of compounds 1-14, respectively. The authors acknowledge the National Research Foundation (SA) and University of KwaZulu-Natal for funding this work. We acknowledge Mr Sizwe Joshua Zamisa for his vital assistance in single X-ray experiments.